Oh Robusto, where have you been all my life? Having a sore throat is an occupational hazard. Two days without chocolate and counting, I've decided to use this excruciating time to explore other options. Here's how I'm rocking my sore throat. The boring way to OD on Vitamin C is to drink loads of orange juice and eat fruits. Don't be a goody-two-shoes; spice it up! As stubborn sugar addicts go, my new BFF is vanilla yogurt. Today I dipped some sliced honey dew in creamy yogurt and it's a match made in heaven. So good it doesn't even feel healthy. Have you met? Robusto Cheese is like that hot bachelor you're dying to introduce to your single girlfriends. Hell, even the name sounds handsome! Rrrrrobusto. 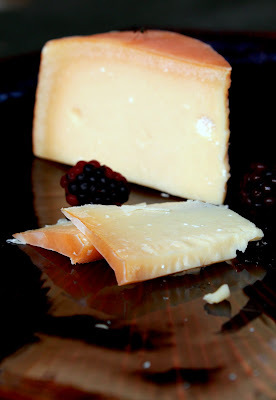 A gouda-style cheese (aged at least 90 days), it's sharp, milky sweet and rich enough to be dessert. It's an awesome catch and worth the price ($8/slice). I swear, if the aroma doesn't get you, the taste will. Rrrrobusto. Try it with grapes--ayayay, mucho delicioso! I found this Mandarin Orange Jello Salad recipe that I can't wait to try. The recipe calls for crushing a 1000mg tablet of Vitamin C. Plus, cottage cheese on fresh fruits? Count me in! It takes about all of 10 minutes to make so even a 100-degree fever shouldn't stop you. I give myself two more days until I can finally get some chocolate back in my system.